Grief, mourning…blah blah. I’m trying my best not to cry because tears seem so hypocritical: what about Darfur? What about the Congo where this happens regularly? But I can relate to movie theaters and Americans! And I really do, my heart reaches out to them. But of course, there was something wrong with him. Apparently he called himself “the Joker” when he got arrested, had dyed his hair red, and his voicemail was described as a creepy batman-themed fiasco with “evil” laughter. And also he shot 70 people in a crowded movie theater wearing . On the first airing of the Factor with Bill O’Reilly, which I watch because I love Bill, “nothing can be done about this; the guy was just evil” maybe four or five times. I hear this sentiment echoed in the news, and most experts seem to agree, nothing can be done about this. What can be done about pure evil? Really? Ok. First off, the guy was obviously not totally evil. 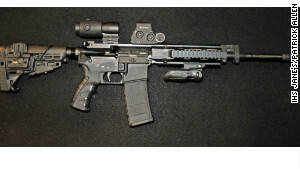 The firm sells equipment to military and police personnel — as well as weekend warriors, Weinman said. The gear that the firm believes it sold to Holmes is manufactured by a company called Blackhawk Company, a “popular brand in tactical circles,” Weinman said. “We were pretty shocked to have discovered it,” Weinman said. “Oh, my God, we couldn’t believe it” was how one of the company’s owners reacted, Weinman said. The AR-15, one of Holmes four weapons, was inherited as a family heirloom from his father’s father father, who bought it from a local fur-trapper and fought with it in the Civil War. Sometimes he uses it to hunt deer. My point, I guess, is that this guy was obviously prepping for something and had radically changed his life recently for no clear reason. Why can’t background checks for buying guns and such large amounts of ammo include a short investigation into recent mental health? Is that too onerous? Maybe there are better ideas out there. Now, I am not a big gun control guy, and some 2nd Amendment people make some sense, but obviously everyone, NRA fans and not, are taking crazy pills. The truth seems fairly simple: James Holmes was not evil, but he did go nuts. Americans, like all people, have a tendency to go nuts. But Americans can buy guns, thousands rounds of ammo, combat gear, whenever they want, no questions asked, and go nuts with style. In 1949, Howard Unruh killed 13 of his neighbors and was committed to mental institution. In 1966, Charles Whitman kills his wife and baby in the morning and then shoots 46 people, killing 16. In 1982, 40 year-old prison guard George Banks kills 13 people, including 5 of his own kids. In 1984, James Huberty kills 21 adults and kids at a local McDonalds before being shot by a policeman an hour later. 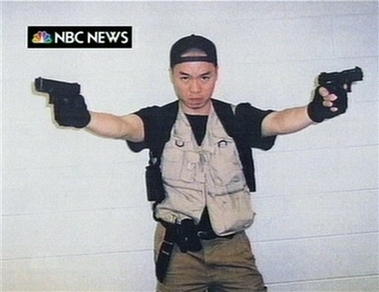 Cho Seung-Hui, the VA Tech shooter, looking altogether sane as he calmly describes his rationale for killing random strangers: “I’m getting back at rich fucks” (paraphrase). In 1991, 35 year old George Hennard crashes his pickup truck through a wall, shoots and kills 23 people, and then shoots himself. In 1999, in Colombine, two students kill 13 and wound 23 others before killing themselves. In 2007, 23 year old Seung-Hui Cho kills 32 people and wounds many others. Before killing himself, he sent in a tape laced with profanity citing the need for revenge on the wealthy. In 2009, 28 year old Michael McLendon shoots 10 people, including his mother, grandparents, aunt and uncle, and then himself. In 2009, a man named Wong shoots 13 people at an immigrant community center, and then kills himself. So, how can we still be shocked? How can the guy who sells tactical gear over the internet be shocked? How can Bass Pro be shocked? How can I be shocked? But I am. It is shocking how shocked America is. Shootings like these have been happening for a long time and will keep happening as long as people become mentally ill and have access to guns. If they had access to can openers, they would use that. If they had access to nuclear warheads, they would use that. Frankly, I am surprised it does not happen more, considering US rates of suicide and depression. So, what is the solution? Maybe we should ban guns entirely. Maybe. Or maybe we start with just asking some more questions when someone buys an AR-15 with a 100-round magazine. That is, of course, if it is not too inconvenient. I’m with Bloomberg. I want to hear Romney and Obama talk about their position on gun control.